Renovation strategy for buildings. 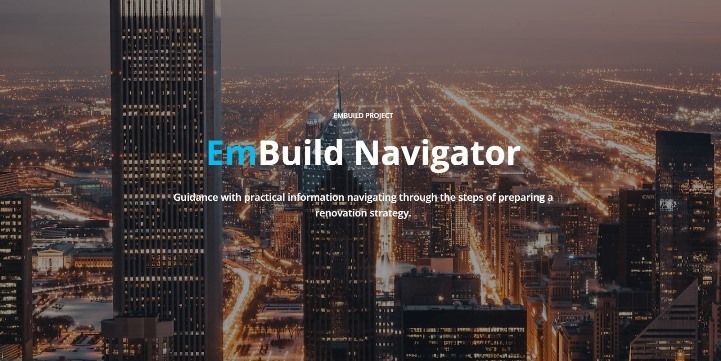 The H2020 EmBuild project launches the Navigator, a practical guidance for the formulation and implementation of an effective renovation strategy for buildings. In the event Energy Efficient Buildings – Plan. Invest. Renovate!, final conference of the EU-funded project EmBuild took place. At the event, the Navigator, a comprehensive online guidance tool providing practitioners in Europe with practical instructions on how to design and implement a renovation strategy for buildings, was launched. The H2020 project EmBuild worked directly with public authorities in towns and regions in Romania, Bulgaria, Slovenia, Croatia, Serbia and Germany, to generate new tools, better processes and enable higher capacity in local governments to design ambitious but realistic renovation strategies. Some of these efforts resulted in the Navigator, an online practical guidance that will navigate the reader through the steps and milestones of preparing a renovation strategy. The EmBuild Navigator is structured around three main pillars: Plan, Invest, Benefits, which all are all aimed to provide local municipalities with the right toolbox to construct a successful strategy for the renovation of public buildings. The Navigator starts with the planning: the value of a strategy consists not only in the renovation strategy itself but also in the process behind its development. The available tools include spreadsheets, templates and analysis on the exploration of the regulatory framework, the technical solutions, the barriers, and a national renovation strategy template respecting the requirements of Article 4 of the Energy Efficiency Directive. The second step after the planning is the means needed to implement the strategy. EmBuild partners provided a set of best-practice examples and recommendations on how to plan and direct interventions on public buildings and private housing and attract investment. The last section of the Navigator is focused on the wider benefits of energy efficiency. The Navigator provides local authorities with a reference to address benefits of renovation measures to target groups, as well as to strengthen motivational aspects in building renovation programs and illustrate that renovation is not only a matter of energy savings. The tools will raise the knowledge and awareness amongst local stakeholders on the wider benefits of renovation, such as comfort, air quality and local jobs. With the use of EmBuild material, municipalities can use a comprehensive approach to plan, invest and implement wider benefits in their decision-making process and in the necessary reporting and evaluation schemes for deep renovation measures. EmBuild – Empower public authorities to establish a long-term strategy for mobilizing investment in the energy efficient renovation of the building stock – is a project financed under the Horizon2020 Programme of the European Union and explores the modalities of investment in energy efficiency in public buildings with a special emphasis on the local level. Its main objective was to empower public authorities at local, regional and national level to formulate renovation strategies for the building sector that foster deep renovation and facilitate the acceleration of the renovation rate. Partners of EmBuild: 10 partners: two have regional or international mandate (NALAS and BPIE), and 8 national partners from 6 countries: EnEffect (Bulgaria), REGEA (Croatia), GIZ, eza!, Technical University of Munich (Germany), AE3R (Romania), University of Belgrade (Serbia) and KSSENA (Slovenia). EmBuild stands for Empower public authorities to establish a long-term strategy for mobilizing investment in the energy efficient renovation of the building stock. This project has received funding from the European Union’s Horizon 2020 research and innovation programme under grant agreement No 695169.